The small intestine is lined with millions of tiny finger-like projections called villi. These villi absorb digested food, vitamins and minerals from the lumen of the intestine into the blood vessels contained within them. The shape of intestinal villi is important because it increases the surface area that is available for nutrient absorption. Celiac disease, also called coeliac disease or celiac sprue, is an autoimmune disorder which damages the villi in response to gluten ingestion. Gluten is a protein complex made up of the compounds gliadin and glutenin that is found in wheat, rye and barley and is often used in other foods and products for its structural properties. In celiac disease, the body is unable to digest components of the gluten protein, specifically regions of gliadin that are rich in the amino acid proline. These remain intact in the small intestine.1 The body responds to their presence by signaling the immune system to react against the protein, initiating the recruitment of T cells (a kind of white blood cell) that cause inflammation in the intestinal lining. Villi are damaged by the local inflammation, causing them to lose their structure or “flatten.” This damage reduces their absorptive abilities for macronutrients, fat-soluble vitamins, electrolytes, calcium, magnesium, zinc, folate and vitamin B12. If celiac disease is left untreated, damage to the small intestine can be chronic and life threatening, causing an increased risk of associated nutritional and immune disorders. It is possible for celiac disease to remain dormant or undetected for years, but it can develop as early as infancy. Many times, the onset of the disease is triggered by a traumatic event, such as surgery, child birth or emotional stress. Symptoms of celiac disease vary significantly from person to person. This is partially why diagnosis is often delayed. 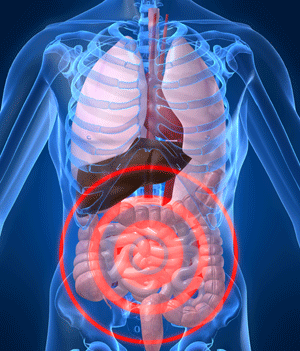 Symptoms can occur in the digestive system or in other parts of the body. Some people have mild inflammation with few symptoms. But even if people feel well, damage can still occur to the lining of the bowel. Other people have more severe inflammation, which causes symptoms severe enough to lead them to visit their doctor. Occasionally, individuals do not have any symptoms even though their small intestine is severely inflamed. Infants and children with celiac disease are prone to developing permanent and more serious symptoms if the disease is not managed early. Stunted growth, delayed puberty and dental enamel defects are all effects of mal-absorption during youth. Celiac disease has no cure, but maintaining a strict gluten-free diet is crucial to avoid disease progression and further complications. When untreated, celiac disease can cause several complications and even be life threatening. Patients with celiac disease who do not adhere to the gluten-free diet typically continue to suffer from symptoms such as abdominal pain, bloating, gas and diarrhea. In addition, these patients are at higher risk of developing complications such as cancer of the small intestine and esophagus, and narrowing in the lumen due to inflammation. Celiac disease has also been associated with neurological complications, including epilepsy (seizures) and peripheral neuropathy (nerve damage). Celiac disease can be effectively managed by completely removing gluten from the diet. Once removed, inflammation in the small intestine will begin to subside and healing can begin. Even a small amount of gluten is capable of causing symptoms to return. Gluten is found in wheat, rye and barely and foods and products made from these grains. It can also be used in certain medications and everyday products like lipstick and envelope adhesive. Completely avoiding gluten is difficult. Many everyday foods and items are hidden sources of gluten, so it is important to diligently check the ingredients. Fortunately, gluten-free product lines are continuously expanding and more gluten-free alternatives are becoming more readily available. 1. Hausch F, Shan L, Santiago NA, et al. Intestinal digestive resistance of immunodominant gliadin peptides. Am J Physiol Gastrointest Liver Physiol. 2002; 283(4):G996-G1003. 2. Oberhuber G. Histopathology of celiac disease. Biomed & Pharmacotherapy. 200; 54(7):368-372. Tiruppathi C, Miyamoto Y, Ganapathy V, Leiback FH. Genetic evidence for role of DPP IV in intestinal hydrolysis and assimilation of prolyl peptides. Am J Physiol. 1993; 265(1 pt 1):G81-9.